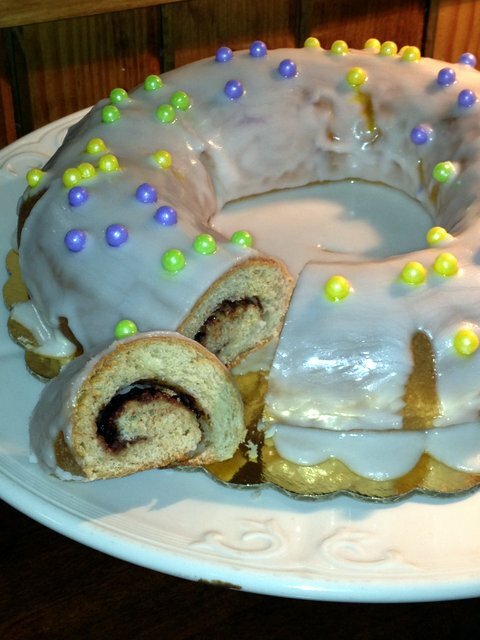 Mardi Gras falls on February 12, 2013, so king cake season is in full swing right now. Thanks to generous coworkers who uphold the custom of “baby recipient brings the next cake”, I’ve sampled cakes from no less than six bakeries and supermarkets. So far, the standouts have been Gracious Bakery (pictured), featuring a light, cinnamon brioche filled with a whisper of chocolate, and Maple St Patisserie (almond paste filling, plus praline pecans scattered atop the cake). Third runner up was a lightly filled apple-pecan cake from Nonna Randazzo’s. But I’m sure we’ll sample additional versions in the remaining days of the season…. My all-time favorite cake is a cinnamon-pecan filled from Cajun Pecan House in Cut Off, LA: CPH ships cakes, but only to a limited area. Before Ash Wednesday, I’m also hoping to sample Domenica’s over-the-top king cake (definitely click to see it here): filled with bananas, mascarpone, and caramel, decorated with bits of gold leaf. Order one here. Ever had one from Poupart’s over in LaFayette? It’s my gold standard. No, I’ve never sampled a Poupart’s king cake, but everything else at Poupart’s is pretty high quality. I imagine the king cakes are equally good. Now, I want a king cake from the Pecan House. And an apple fritter. At least we’ve got brisket. I have had very little king cake this year, but I made a small galette des rois with ground pecans instead of ground almonds/almond flour (sub 1:1 by weight) and it was phenomenal. Very much recommended if you find yourself with puff pastry on hand. Pecan meal makes killer shortbread, too. I remember the first time I ever heard of King cakes when we got one from an attorney firm we used in Metairie, I had no clue. That first shot you have is a gorgeous cake! For the record, I’ve never gotten the baby. I had the Poupart’s. It’s good. There’s a place in Baton Rouge that sells them undecorated. The icing and colored sugar is included for a “do it yourself” cake. The kids have a blast doing it. Some of the “mail order” cakes ship with the icing and sugar on the side. Apparently, the cake stays tidier through shipping without the toppings. jean uzee, could you please provide the name of the Baton Rouge bakery that sells undecorated king cakes? Thank you. Thanks, Celeste. A friend recommended your site and am enjoying it. I live in Lafayette and the French King Cake from Poupart’s is a TREAT! I highly recommend it. As is everything else in that shop. Glad I live 350 miles away or I’d weigh 350lbs,half of which would be due to boudin from Johnson’s, the other half courtesy of Poupart’s.